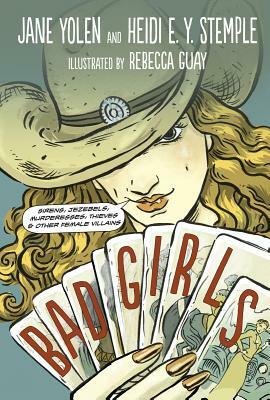 Bad Girls by Jane Yolen and Heidi E. Y. Stemple. Charlesbridge, 2013. Currently Available. Face Value: Completely gorgeous. It looks like a classic comic, which is what attracted me to this book on the library shelf. It’s also marketing genius to make a non-fiction book of biographical sketches look like an action-packed graphic novel. Does it break the slate? Eh…no. The book has a potentially Slatebreaking concept but falls short of what is hopes to accomplish. The authors have written brief historical profiles of “bad girls” from throughout history. These are women who were notorious for murdering, thieving, or other forms of criminality. In some cases, they were simply known as ‘bad girls’ simply for being powerful and having several sexual partners. The authors supposedly want the reader to make her own decision about whether or not these women deserve such a bad reputation, but the text is incriminating in its own way. Who would we give it to? History lovers would enjoy these short profiles of infamous women. It’s also got some great artwork mixed in, and is a nonfiction book that might appeal to graphic novel lovers. Review: What makes someone a ‘bad girl’? That is the concept that Yolen and Stemple set out to explore in this book. They have researched notorious women from throughout history and presented their cases as short nonfiction profiles for a reader to examine. The premise is that we can read their stories and decide for ourselves whether history has judged them unfairly. Included among the ranks of the ‘bad girls’ are Jezebel, Salome, Catherine the Great, Lizzie Borden, Mata Hari, and more. The profiles are written in an engaging voice. They provide basic biographical information and summarize the crimes or acts of which these women are accused. The profiles also discuss why the woman may have been motivated to do such things. Was she under a great deal of economic pressure? Was she hungry for power? Was she defending herself against abuse? The authors are careful to include possible explanations and highlight reasons why a girl might have to go to such lengths to be safe or successful. Each profile includes a beautiful portrait of the woman in question by illustrator Rebecca Guay. Her work is stunning. She brings each woman to life, and adds an air of mystery to their images. The comic-style artwork gives this book a contemporary look that sets it apart from the other boring nonfiction biography compilations on the library shelf. In between each profile, there is a one-page comic layout of the authors Yolen and Stemple talking about their work on this book. At first, I thought this feature was an interesting intertextual way to include an author’s perspective in a nonfiction book. How brilliant to include a comic strip section in which the author can acknowledge bias and pull back the curtain on the process of writing nonfiction! I wouldn’t mind seeing something like this in more nonfiction books. However, the way this device was used throughout the book really challenged the potential Slatebreaking nature of this work. The authors debate whether or not each woman was really a bad girl, and often come to differing conclusions. Yolen tends to be more forgiving, acknowledging that extreme circumstances can lead women to do extreme things. Stemple seems to be more conservative in her judgment of the women, pointing out that laws are laws and that a moral code is not to be violated. I found it difficult to draw my own conclusions about the women featured in this book because the authors were already having those conversations and recording them in the comic interludes between profiles. This book format had major potential, but doesn’t deliver. Lt could be a thought provoking educational tool if enjoyed and discussed by a group of readers. However, as a standalone work of nonfiction, it just didn’t cut it for me. This entry was posted in Nonfiction, Reviews and tagged Biography, criminals, famous women, history, Nonfiction. Bookmark the permalink.